Hands up who has ever heard an AC/DC song come on the radio and reached for that volume dial and broke out the air guitar!! You are not alone! Did you know though that you can learn all you need to crank out classic AC/DC songs on guitar with just a few simple chord shapes. Guitarists Angus Young, famous for his stage schoolboy uniform and brother Malcolm Young do not rely on traditional power chord shapes in creating their sound. They take a unique approach by using open chord shapes but removing notes to shape their bone crunching riffs. They take all the “thirds” out of the open chord shape, leaving us with the root note and the fifth note of the scale. Look at our post regarding Inventing Chords for further information. Therefore we end up with a power chord in a non traditional shape. This post does assume you have some prior knowledge of playing power chords, open chords and some idea of chord theory. Click the links to read our guides about playing these kinds of chords if unsure. call Rhys on 0421 705 150. Their sound has unconventional elements for a hard rock act such as their chord style and amplifier tones as explained below. The unique feature of their guitar style is that AC/DC use open chord shapes but remove notes. Removing these notes creates a power chord sound. There are 6 chords in particular that are commonly used in the AC/DC songs. 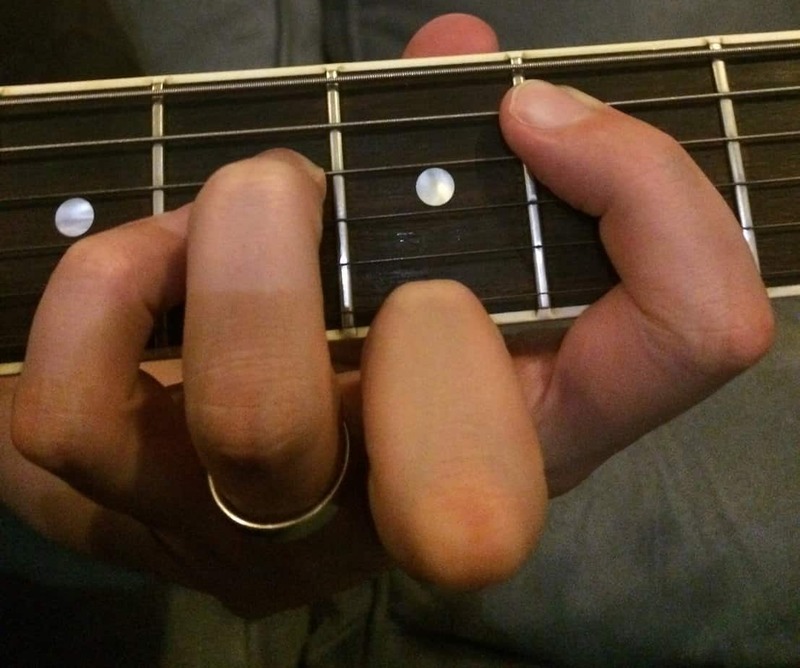 Form a G open chord shape using four fingers. Remove the fingers on 5th string and optionally the 1st string. You now have created a shape that only has the notes G or D playing, meaning you have create a G power chord. This chord is the cracking sound that starts the verse of You Shook Me All Night Long. 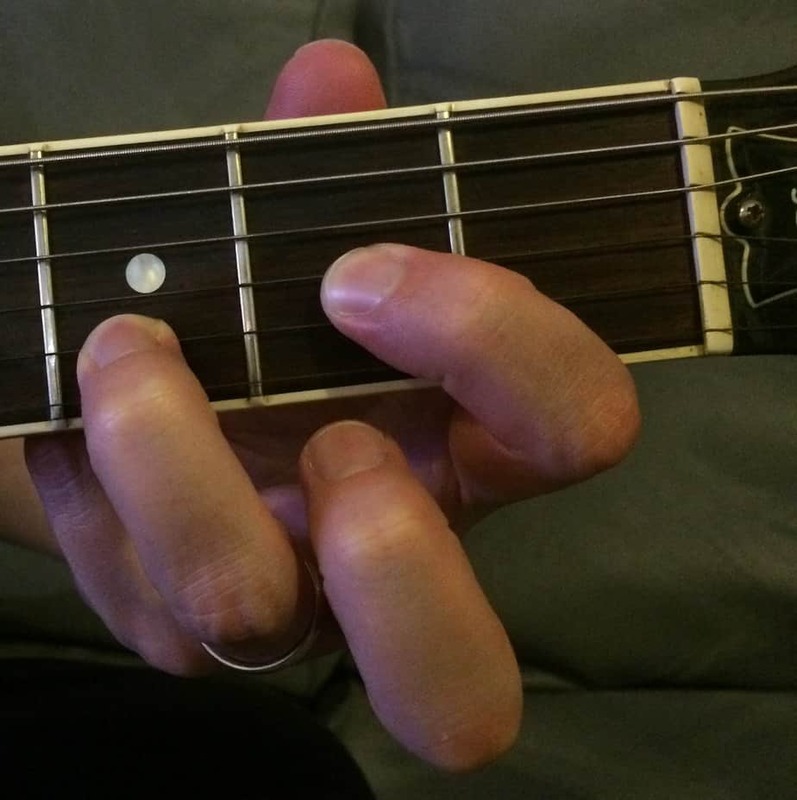 Forming the G chord shape this way allows quick changes to other chords like G and D.
Like the G chord, simply move our top finger down to the 5th string to create this chord. The A open chord can be formed by either using three separate fingers or with one finger barring the strings. We want the barring style for achieving the AC/DC sound. Instead of striking all strings in the chord we will only hit strings 5, 4 and 3. This creates a power chord sound when eliminating the 2nd string note. We can form this with one finger like the A chord. Hitting the three wound strings on the guitar only (strings 6, 5 and 4). This gives you the smashing first chord of Back in Black. Form an open D chord. Remove your finger from string 1. 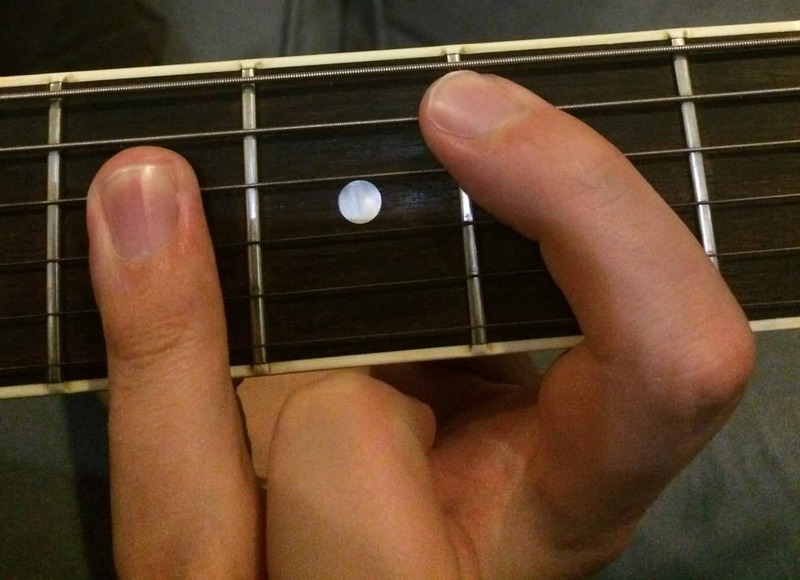 Do not strike string 1 while playing this chord, only strings 4, 3 and 2. You may like to mute 1st string by resting the finger on 2nd string against it. The B chord can only be played as a barre chord and therefore creates the more traditional way of playing a power chord. Two ways you can do this are forming a major 5th string barre chord and only hitting strings 5, 4 and 3. An alternate is forming a B power chord and adding pinkie finger underneath it. This will get the thicker tone needed through adding one more note (an octave for you theory nerds at home). Hard Rock in the style that AC/DC are associated with usually means turning the distortion up to maxium. Guitarists label this a high gain sound. Closely listen to one of their songs. You find that the tone is not nearly as distorted as you might think. It is a much cleaner volume driven sound. To achieve the AC/DC tone I recommend starting with your gain dial of the guitar amp at 4 or 5. Turn the volume up the touch higher than usual. This combined with the unique way of creating power chords give you that AC/DC sound. For solo boost use a pedal that will add the smallest amount of distortion with an emphasis on more volume. You are searching for a lead guitar tone that cuts through the band and provides more sustain, edging on feedback. To go the extra mile get yourself the guitars and amplifiers that Angus and Malcolm are famous for using. Angus has always used Gibson SG model guitars with humbucker pickups. Malcolm uses Gretsch guitars and now has his own signature model. Both use Marshall amplifiers. Like to know more? Send us a message with any questions, comments or for information about lessons with the Eastern Suburbs School of Music.